Stories surround us. They connect and inspire us. Many of Vail’s stories and defining moments took place in and around a simple adobe, the 1908 Old Vail Store & Post Office. The Old Vail Store & Post Office was the hub of civic and business life for roughly 20 square miles from 1908 through 1992 when its doors closed. 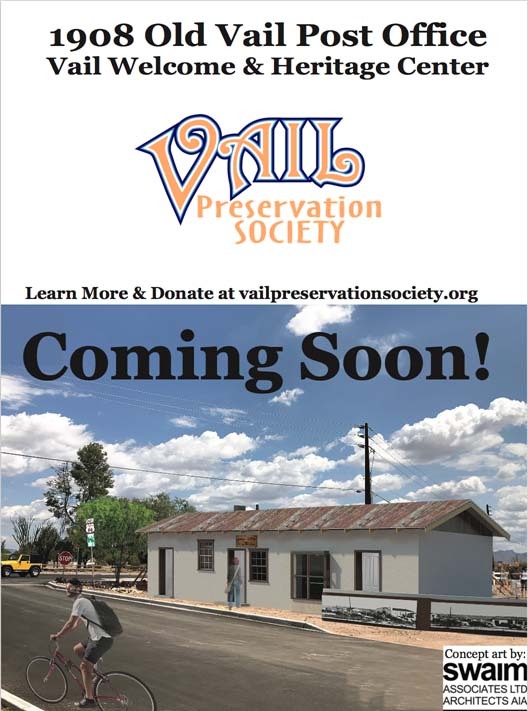 Located at Vail’s original town site, the 1908 Old Vail Store & Post Office sits at the intersection of Old Vail and Colossal Cave Roads, or as we like to say, at the crossroads of heritage and what’s next for Vail. Relationships, special places, shared memories, and plans for the future, these are things that define a community and create connections between people, place, and what matters. The humble adobe is Vail’s sole remaining pre-statehood building. Constructed of 12” adobe bricks it is defined by its utilitarianism. Constructed from locally available materials: adobe, stone rubble, and lime plaster, it also utilizes many salvaged materials as evidenced by the use of 1” X 12” railroad wooden packing crates in the ceiling and salvaged 2”X 4” boards overlapped and joined to create ceiling joists. It reflects the hardy, ‘can-do’ and ‘make-do’ entrepreneurial spirit so characteristic of the individuals who made a life for themselves in Vail, Arizona Territory. To honor the spirit of Vail pioneers, we will incorporate as many “green” and re-use strategies into the building’s rehabilitation as possible. 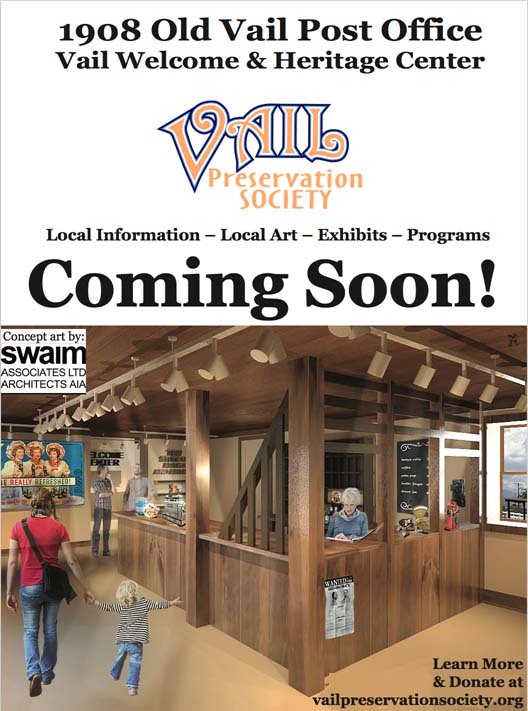 Additionally we will revitalize the civic and social center of the town through the adaptive reuse of the building to serve Vail’s future as the Vail Welcome & Heritage Center. Locals and visitors will be able to enjoy local art, coffee, and old-fashioned treats as well as discover local recreational opportunities, uniquely Vail businesses, live music, programs and more. Together, we will rekindle the heart of Vail. Funds are necessary to accomplish the rehabilitation of the 1908 Old Vail Store & Post Office. Together we can raise the $100,000. needed to get the project well underway. Engineering and architectural services are required, specialized preservation trade skills and instructors for the Cienega H.S. Construction Tech students who will be assisting. Our goal is to begin work after the winter rains. Together we will. 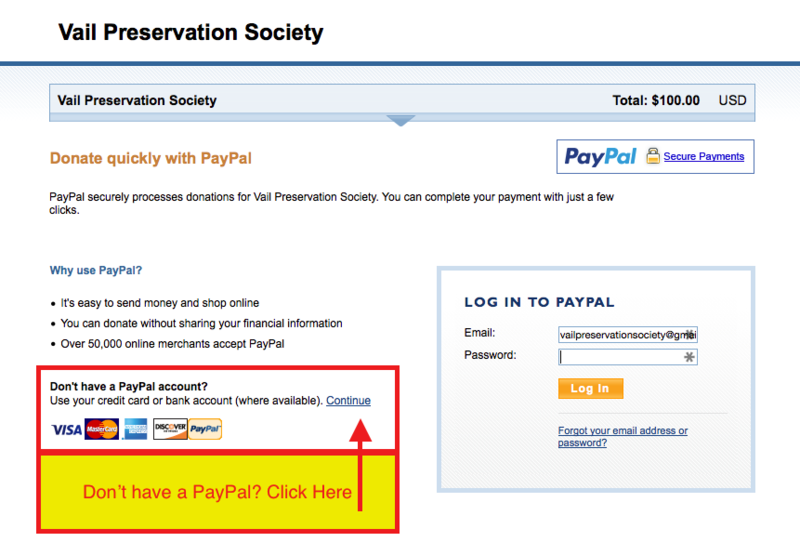 Upon Donation Submission, you can use a PayPal account or use any Major Credit or Debit Card. Use Screenshot below to help you on submission page. GuideStar’s Nonprofit Profiles provide you with the information you need to make smart decisions, build connections, and learn from each other to achieve your missions.